As the sun peeked over Bogus Basin and warmed the tops of the trees the birds really came alive. Lots of Yellow-rumped Warblers, White-crowned Sparrows, Lark Sparrows, and a noisy flock of American Robins. That is the thing I love about birding. On any given day you may see something new. It is always fun to be surprised with birds you've never seen before at a certain location as we had Avimor birds #94 and #95. 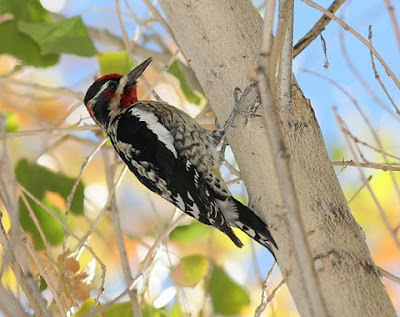 A Red-naped Sapsucker perched briefly on a tall cottonwood and then flew right over my head toward the Boise valley. Just as I was concluding my morning birdwalk on the way to work I was delighted to have a Wilson's Snipe at the edge of Avimor Town Lake. I surprised it as much as it suprised me and I watched as it bolted off toward the protective cover along Spring Valley Creek. Other birds of special interest to me this morning were the Great Horned Owl in the same area it nested in last winter/spring and a Warbling Vireo near Foothills Heritage Park.